Mozilla Firefox is an Internet browser, similar to Internet Explorer, Apple Safari, and Google Chrome, but you can also use it to read ebooks that have the ePUB extension, as long as you install the ePUB reader plug-in. You don’t have to use it for Internet browsing if you don’t want to; that’s up to you. These instructions are two-part: the first part covers downloading and installing Firefox and the second part covers installing the ePUB plug-in. If you already have Firefox installed, skip ahead to Part 2 (item number 7). Go to the top of this window and look for the tab that says Mozilla. Click on that tab, hold down your mouse button, drag the tab out of the window, and drop it on your desktop. Now you’ll have my instructions and Mozilla’s pages both open in different windows. (2) Click on the Free Download button, seen in the red oval in Figure 1 and follow the instructions on that page. There will probably be two pop-up windows that have the selection “Run”–one for the download and one for the installation. (3) When you install, you’ll get a setup wizard to help you. Choose standard settings and click Next when prompted. Don’t click in the checkbox to use Firefox as your default web browser unless you want to, but do click Install. When Mozilla finishes installing, you’ll get a window similar to the one in Figure 2. 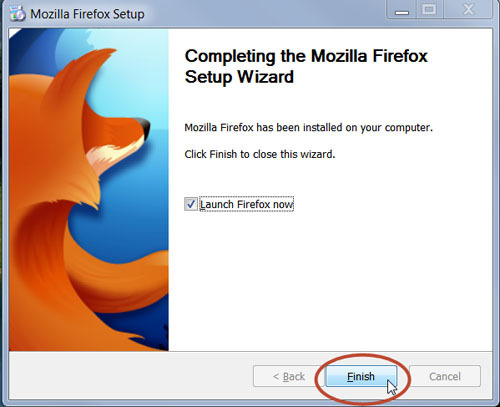 (4) Be sure the box to “Launch Firefox now” is checked and click Finish (red oval in Figure 2). (5) An Import Wizard window should open, giving you the choice to import settings from Internet Explorer or Google Chrome. If you have settings to import, i.e., if you have bookmarks, browsing history, passwords, home page, etc., that you may want to use in Firefox, then click in the appropriate box to import those and click Next. (7) Make sure your Menu Bar is showing by right-clicking in the blue title bar at the top of the Firefox window and checking next to Menu Bar on the drop-down menu. While you’re at it, go ahead and make sure your Navigation Toolbar and Bookmarks Toolbar are showing by checking next to them too. See Figure 3. Figure 3. Menu Bar, Navigation Toolbar, and Bookmarks Toolbar in Mozilla Firefox. (8) Click on Tools on the Menu Bar and Select Add-ons. See Figure 4. Figure 4. Getting to the Tools > Add-ons menu in Mozilla Firefox. (9) In the Add-ons Manager window that opens, type epubreader (all one word) in the search box. You may get several results. Make sure you click Install next to the one called EPUBReader (Note: The version in the picture is 1.4.2.1 but a later version could be available when you are installing yours, and that’s okay as long as it’s called EPUBReader.) See Figure 5. Figure 5. Searching for the ePUB Reader add-on in Mozilla Firefox. When you want to open an ePUB file to read, click in the Menu Bar on File and choose File Open and browse to where your ePUB file is. Alternatively, you can drag the ePUB file and drop it onto the open Firefox window. Your ePUB files that you open will be saved in an ePUB-catalog. There are several ways to get to this catalog. Below I explain a way to add it to your Bookmarks Toolbar. Click on the Menu Bar on Tools and select ePUB-catalog to open it up. Drag the ePub-Catalog tab down onto your Bookmarks Toolbar (see Figure 6). To do this, click on the tab, hold down your mouse key, drag the tab to the Bookmarks Toolbar, and let go of the mouse key. Now you can click on that icon on the Bookmarks Toolbar to open this page. Once it’s on the toolbar, you can rename it if you want by right-clicking on it and choosing “Rename” if available or “Properties” and edit the “Name.” You can also drag the icon to a different location on the toolbar by clicking on it and dragging it to the new location. Figure 6. 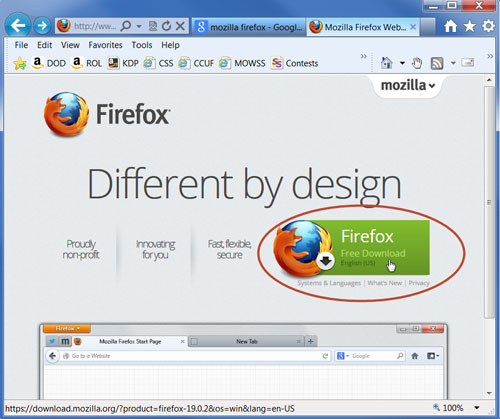 Adding a tab to your Bookmarks Toolbar in Mozilla Firefox.